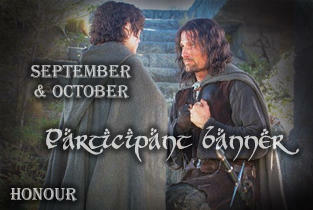 Our theme for September and October is Honour. Thanks to Shire Rose for the suggestion! The concept of honour is very old, maybe as old as human society, although different cultures can understant this term differently. It is an inner moral code that is put above one's well-being and gain. Honour is similar to conscience, a moral compass that helps discern good from evil. But conscience only tells the difference, while honour acts upon it. In some societies honour is celebrated and gives a certain social status. Commiting something dishonourable marks one for the whole life, if people find out about it. And even if they don't, the shame of the act is perceived as a stain on the person's honour by themselves, and can change their life and actions since then. That is, if the person is honourable, because there have always been and will be individuals who do not care for it, and the conflict of honour and dishonourable acts is a driving force of many tales. And like the actions considered dishonourable can be different between cultures, they can also differ between individual people. For example, a man doing woman's work ir wearing female clothes can be viewed as shameful in one culture, while it wouldn't be a big deal somewhere else. But a certain twisted sense of honour can even be found in those who in the tales stand at the side of evil. Maybe they take innocent lives without a wince, but would never betray their commander or endanger their family. Tolkien's world is full of honour and nobility, and these two are very important in his tales. It was honour that made Finrod keep his oath and aid Beren, even though he knew he is going to his death. It was honour that guided Aragorn in protecting the Hobbits, and it was the knowledge that he acted dishonourably towards Frodo that led Boromir to sacrificing his life for them. On the other side, these are characters who maybe understood and had honour once, but it got twisted and slowly forgotten, like Gollum, GrÃ­ma or Saruman. Whether you decide to write about an outher conflict of honour against adversity or the inner conflict caused by the how hard it is to remain honourable in a certain situation, please be honourable and keep our rules. If you would like to illustrate any of these stories, you can take part in our special all-year-round artistic challenge! The Teitho archive does not allow reviews, but as soon as the stories are posted somewhere else online, we will update the stories with a link. Follow us on facebook, tumblr or twitter to get a notification about this!